Don't forget to enter the GIVEAWAY!! We don't want you to miss out on free fabric! We upped the odds by adding two more charm packs! That means 5 winners!! We just love all the ideas you guys are coming up with so we are trying to make more opportunities! Enter now! Only 24 hours left! The contest closes at 12 MST tomorrow. Winners will be posted and contacted shortly after! 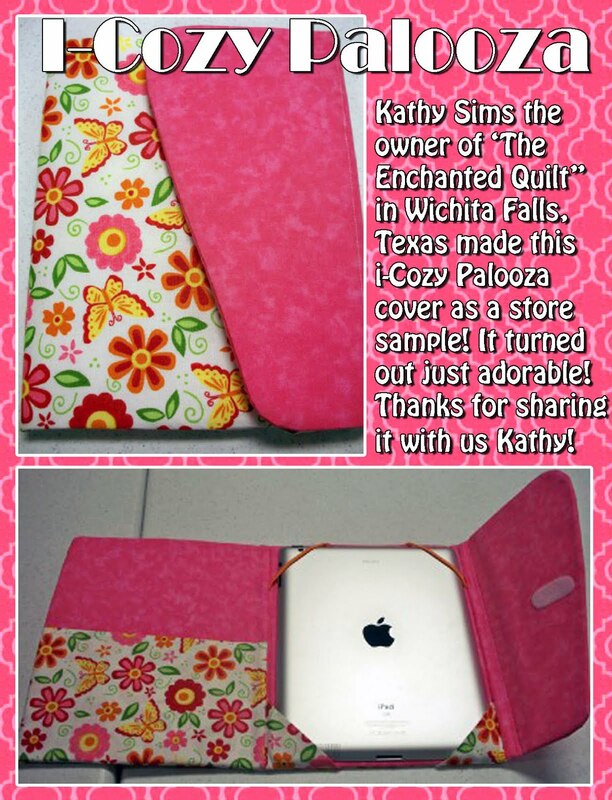 Wouldn't winning free fabric be a great start to the long holiday weekend!?! =] Enter here. All finished! Right down to the swatch page! Now the print outs are off to RJR just in time for Labor Day Weekend! Sue and Bernie are headed up to North Dakota for Bernie's Mom's Birthday, while Megan and I will stick around and keep the cats company! 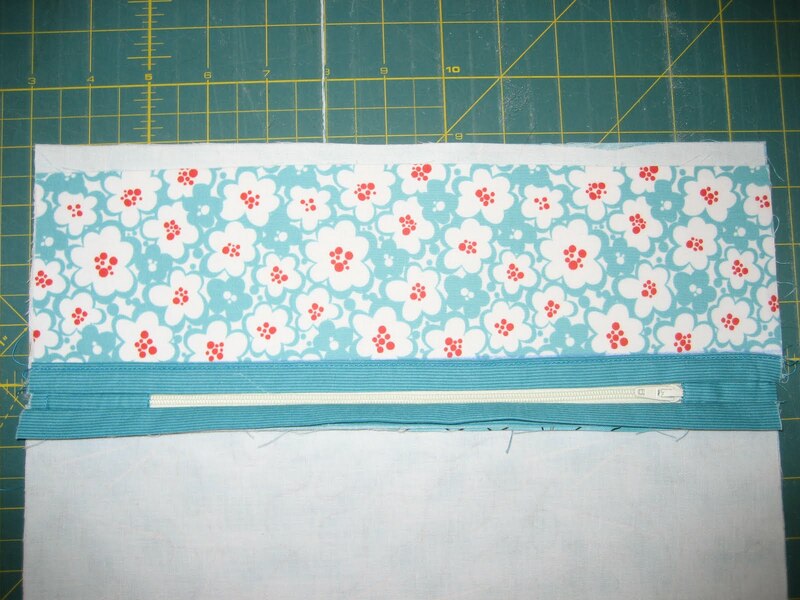 Sue has been slaving over this line for the last few weeks so we are all very excited it is done! Now it is the waiting game! Hmm maybe we shall design some patterns for the fabric while we wait! I think we shall! 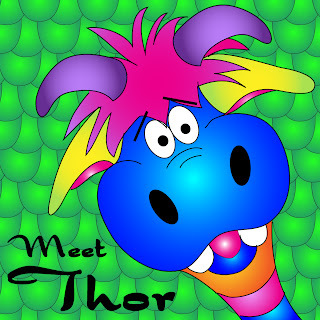 Let us introduce you to Thor! He is star dragon in our upcoming line of fabric for RJR: Days of Yore! 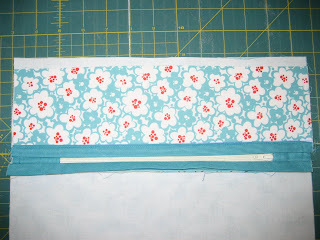 This is just a little teaser because we won't get the fabric until Spring 2012 but we just couldn't wait to show him off! 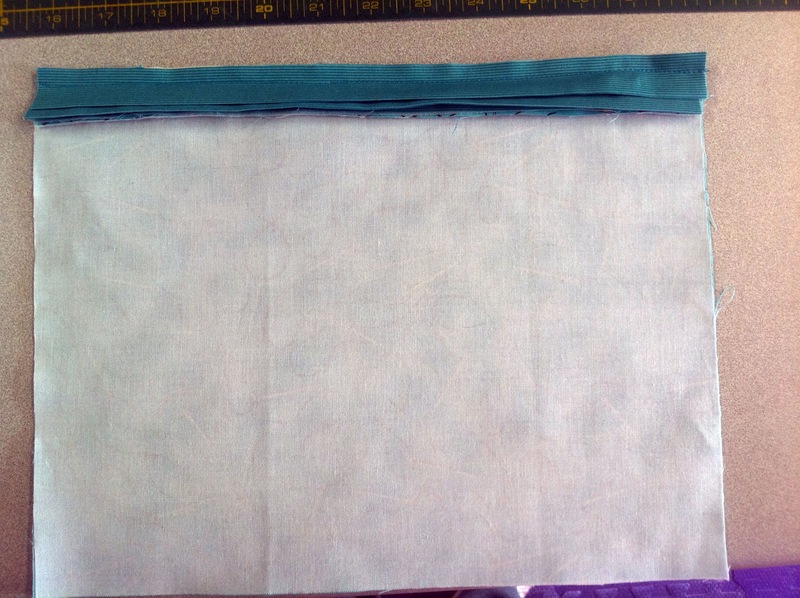 Accompanying Thor will be many other dragons, a soft book panel, a large panel and lots of fun coordinating fabrics! We hope you love him as much as we do! As we know, some of the best things in life are difficult. =] Well, definitely not simple. 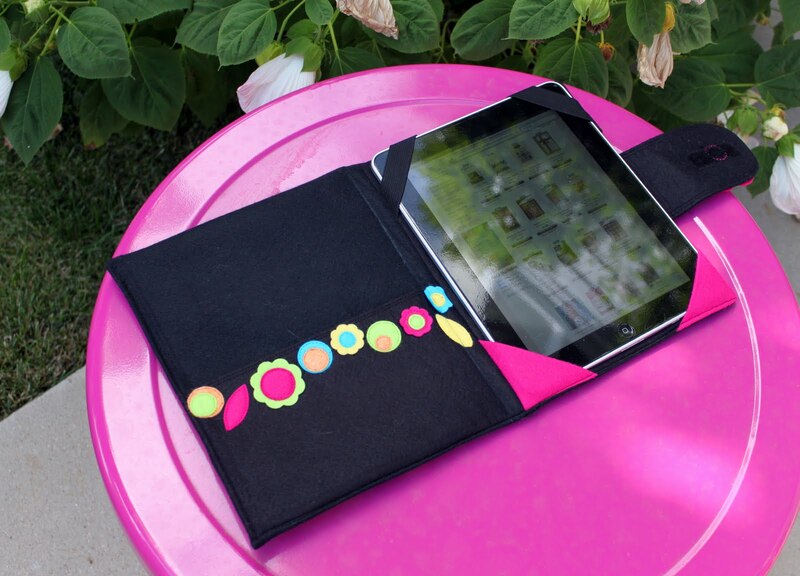 We love the Zerba Bag, and get lots of compliments on them around town! The steps aren't hard, there are just a lot of them! Add in a little bit unusual construction and we have a few confused purse makers! Here are some photos of the steps U through Z to help! Good Luck! I hope these help! If you still need help do not hesitate to email us! Fun Times with Wool and the Go! cutter! I had a blast using the accuquilt cutter with wool! 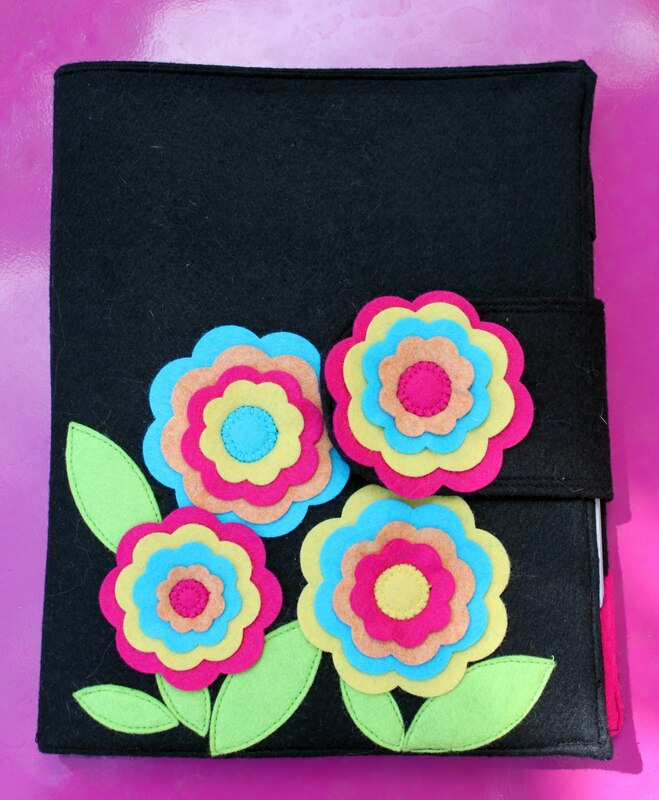 I cut out lots of flowers and then layered them on top of one another to create some three-dimensional flowers on my iCozy Cover! I added some to the pocket in the middle too! The whole thing is made out of wool. 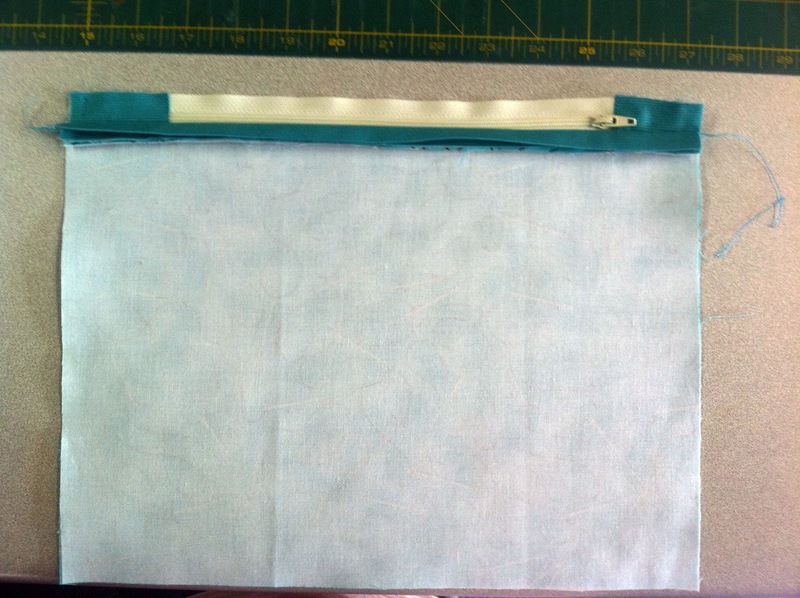 I recommend trying it, but if you do, don't add the lightweight interfacing. You don't need it! Aren't Babies Charming? 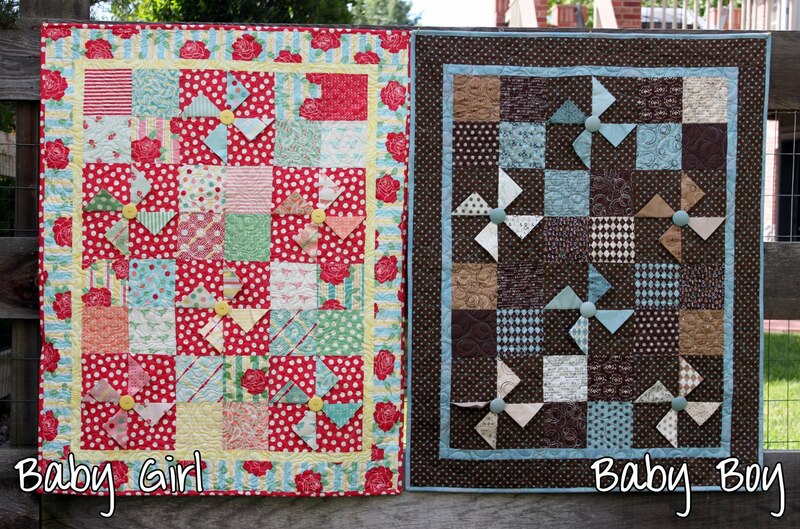 Here is a quick and easy baby quilt pattern that will put to use your charm packs! (perhaps the one below that you may win!!) We made these up in kind of baby girl and baby boy colors! The Baby Girl quilt is made up of "Sweet" by Urban Chiks for Moda and the Baby Boy is made up of "Pure" by Sweetwater for Moda with some others thrown in there! You can buy the Charming Baby Pattern here. 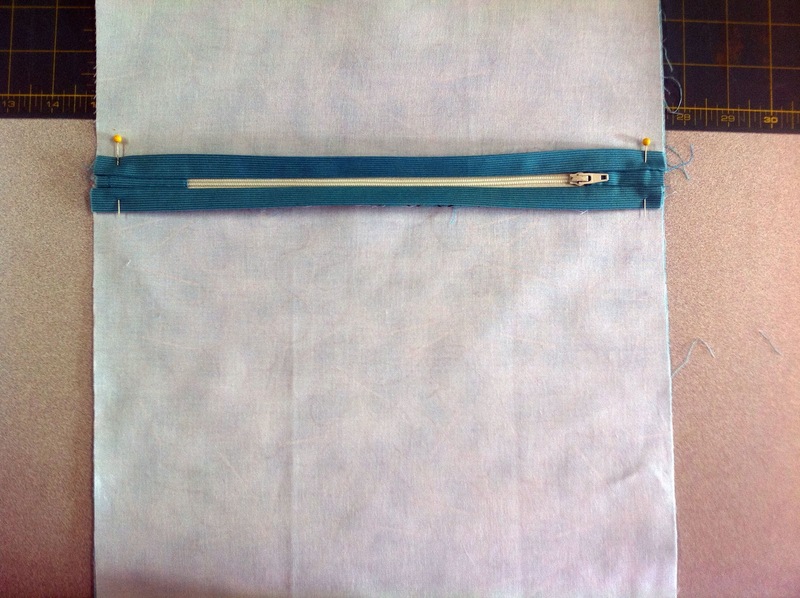 I am about to finish the bag that goes along with it! We will be giving away a charm pack of 'Fresh' by Deb Strain for Moda to three randomly chosen winners! All you have to do is comment on this post! 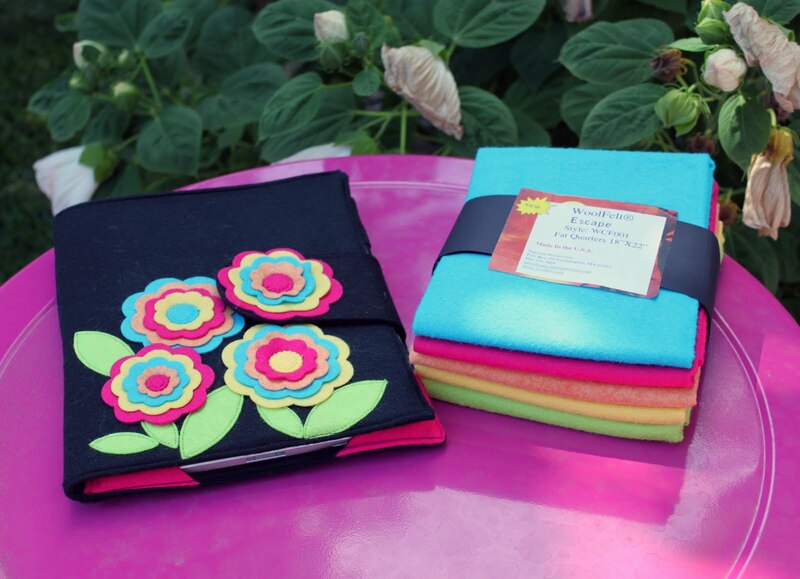 Tell us what you would make with the charm pack and include your email address! Comment away!! We will have not one, not two, but THREE winners! Don't forget your email address! Just add it to the end of the note! We will want to know where to mail the goods! If you do not have a Google account, use the anonymous or name/url option! You have until 12:00pm MST on September 1, 2011 to post! Then we will draw winners! Good Luck! We work hard here at Whistlepig! =] And because we work so hard, we have occasional fun days! On Alayna's last day of work we went bowling, got pizza and ice cream for lunch, then made cupcakes! It was a tough day, let me tell you! Sue = "I got Robbed!" 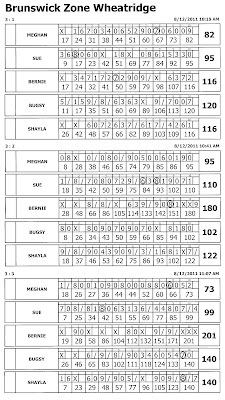 Meghan was notorious for getting a gutter ball then coming back and getting all the pins with the second roll! The pins we conspiring against Sue the whole time, she would get a perfect bowl and 1 or 2 stubborn balls wouldn't fall. 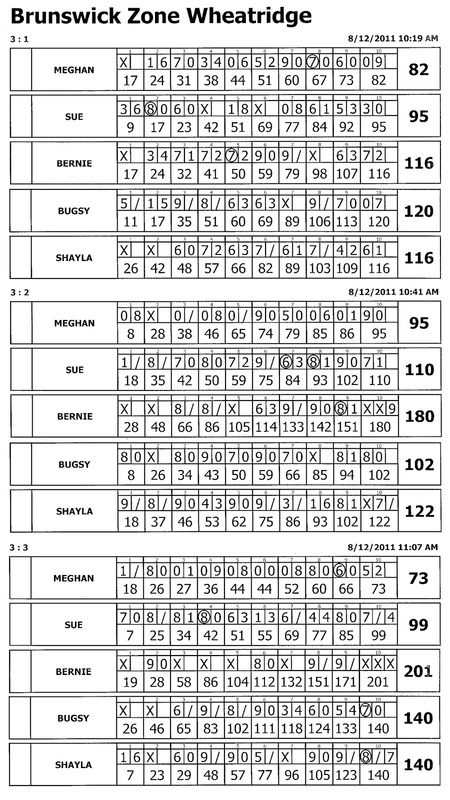 Bernie started out slow but then came back and got a turkey in his last frame! Alayna was the most dainty and smooth bowler this side of the Mississippi, she was one with the floor! And Shayla didn't always do so great on the first ball, but usually picked them up on the second roll. Second up: Pizza and Ice Cream! We ate at Marco's and it sure was delicious! We had everything on the table from cheesy bread and meat lovers to veggie delight! After that we walked across the street for some ice cream (bowling counted as exercise)! Smoothies and gelato were served up while Meghan had a not-so-secret admirer! And last but not least: Cupcakes! Meghan sadly had to leave us for a dentist appointment, so we will definitely have a baking day again in the future! We made carrot cake and chocolate cupcakes! Some big, some small, some perfect, some not! And then we decorated them! so many treats and different frostings to top them off with! We each had out own style so it was fun to see what each other came up with! We will most definitely be having another day like this one! Believe it or not, Summer is almost over. Yes, it is sad, but who doesn't love Fall? I know I do! The colors, the leaves, the pumpkins, the perfect jeans and light jacket weather! Fall is my most creative time of year! Not too cold, not too hot, it is just right! 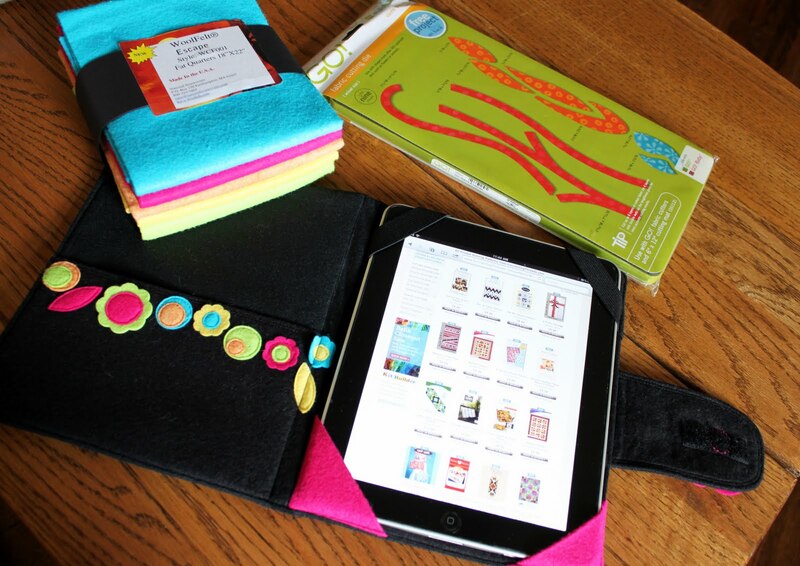 Perfect for finishing gifts for the holidays! Theresa from FabShop says, "Every season, Pantone releases a new color report, an offering of the hues we’ll be seeing in fashion, textiles, and home furnishings for the upcoming season. 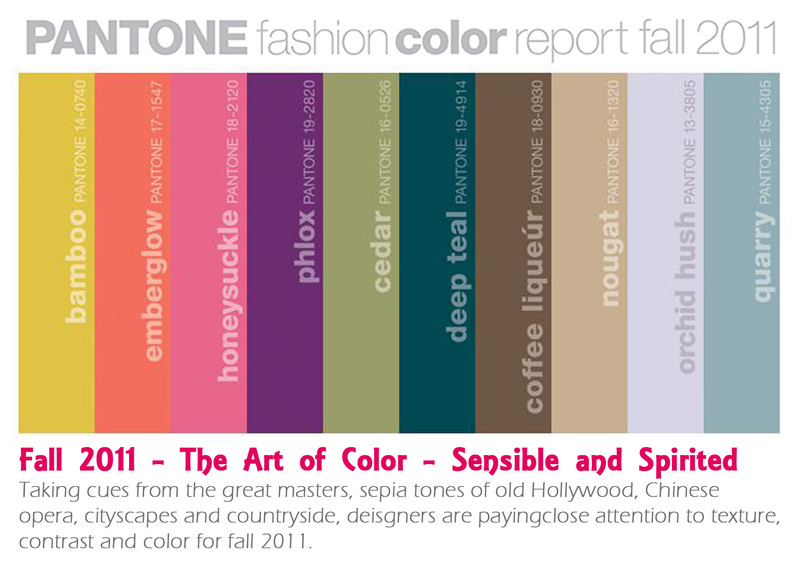 With Fall 2011, the colors have transitioned from the brights of summer to more subdued shades–darker and warmer. 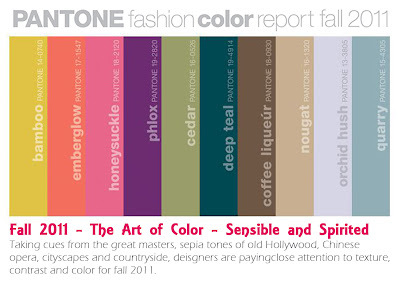 Pantone’s color of the year, Honeysuckle, remains popular and integrates well with the more typical autumn colors. Already these shades are showing up in upcoming fabric collections. Moda Fabrics has a new collection, Indian Summer by Laundry Basket Quilts, which uses the coffee liqueur, nougat, honeysuckle and emberglow colors." 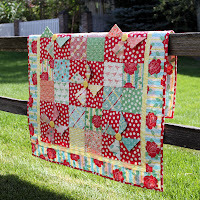 Check out the rest of their article to see a quilt in the Moda Fabrics! And for more details about the individual colors and why they were chosen and paired together head over to the Pantone Website! 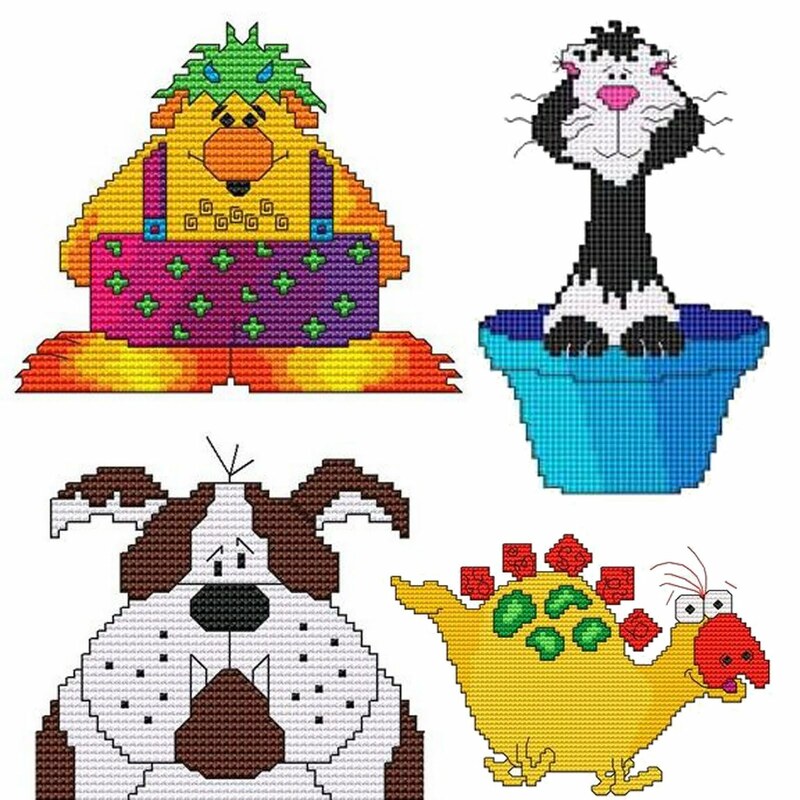 Bubba & Baxter Wall Hanging! This one goes back to our original characters! 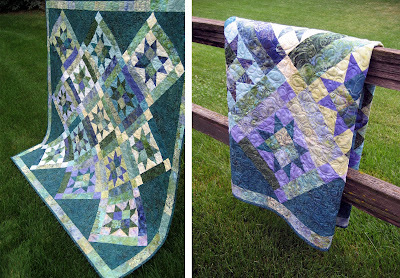 Mary Ellen Laughary has been sewing and quilting for as long as I can remember! (she is my Grandma =]) She worked at Pacific Crescent Quilting in Spokane, WA until it closed and is now working at the Buggy Barn in Reardan, WA. 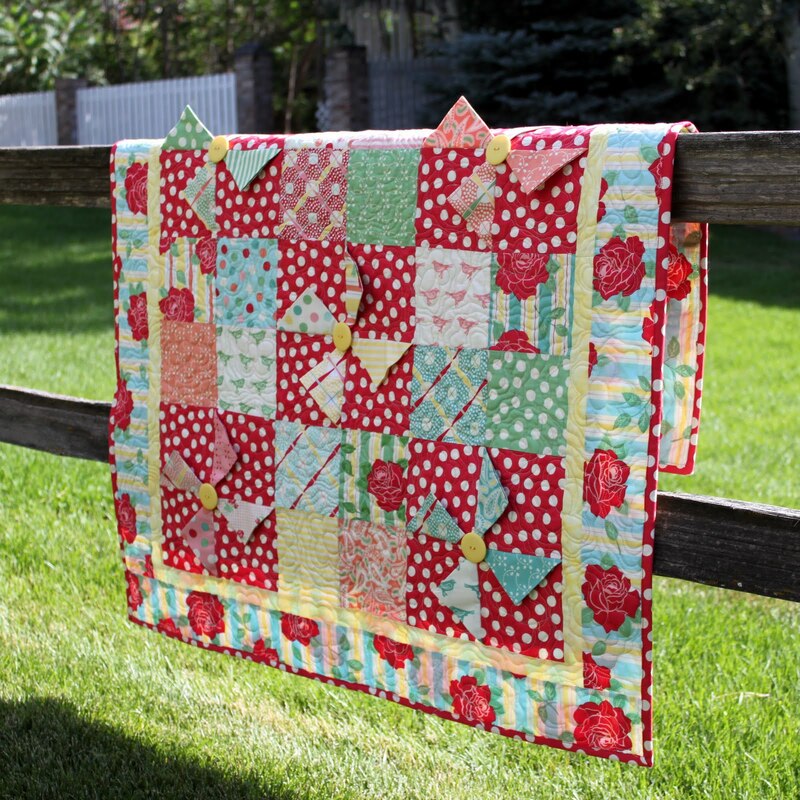 It is a cute little quilt shop out in the country! Mary Ellen is a mother to 6 and a Grandmother to 9 so far! 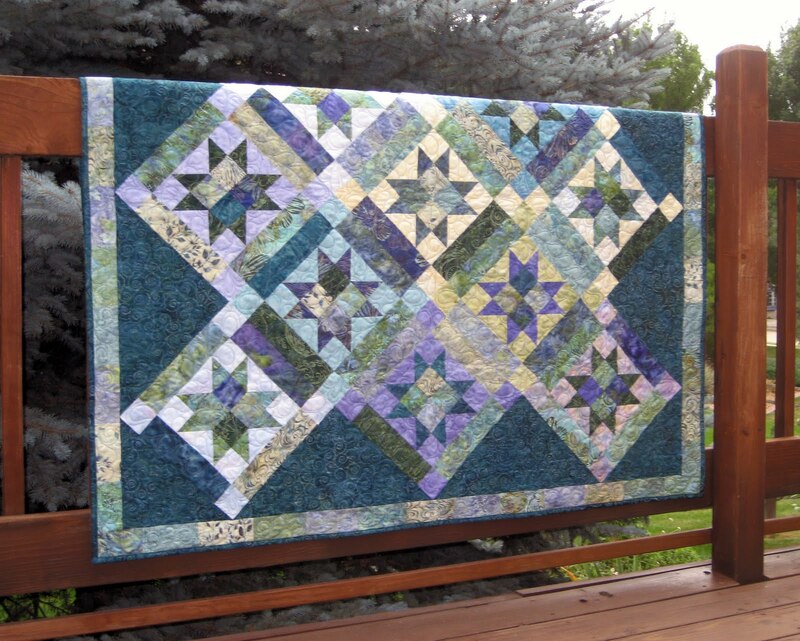 She is currently working on a quilt for her youngest son's wedding present! 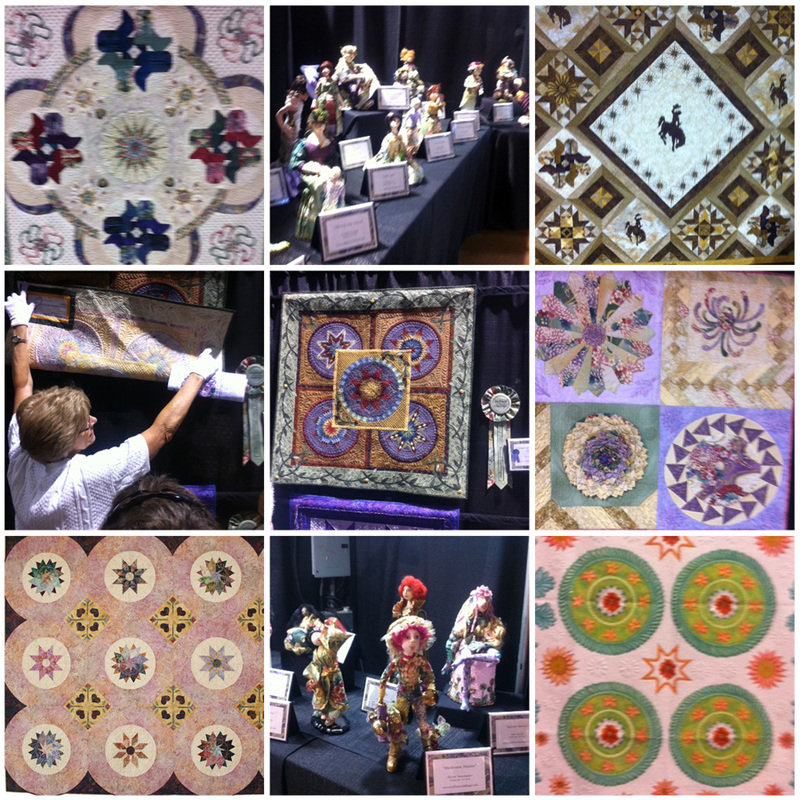 The Rocky Mountain Quilt Festival was held in Loveland, CO this year! We went down this weekend to peek around! It was delightful! 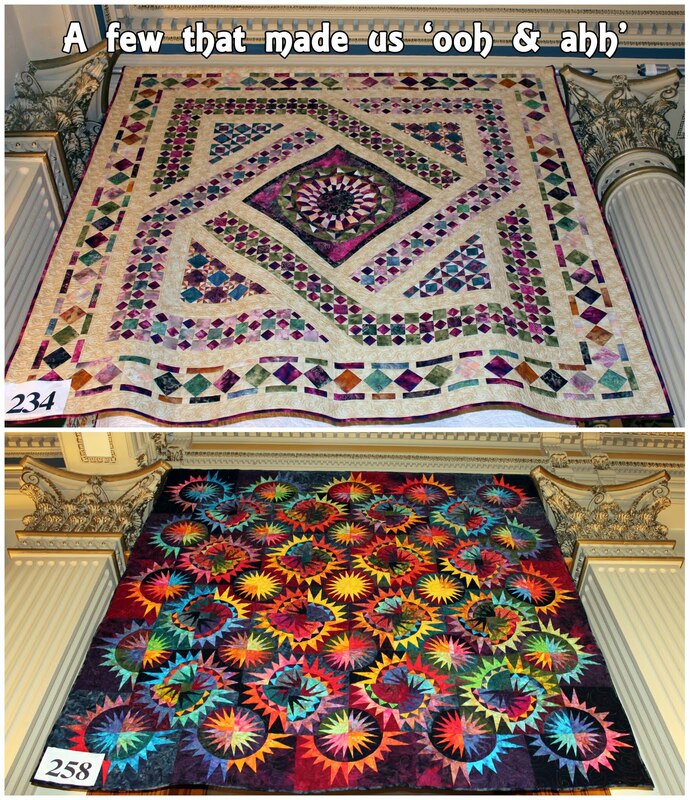 The Hoffman Challenge was on display and it is just fun to see what different people do with the same fabric! Here are a few highlights! 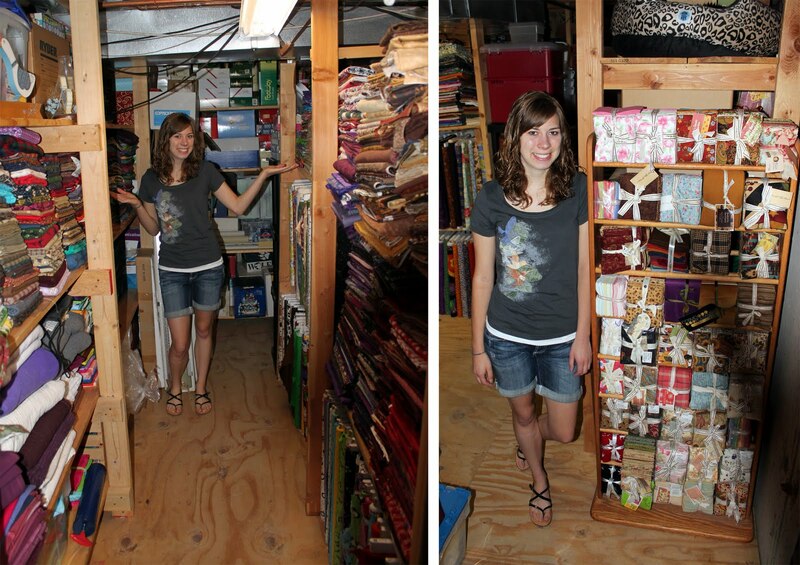 Look what we found perusing 'The Quilt Store,' a local shop. While Kristy Wolf was teaching her Bella Bella class, Cindy came in to do some shopping and say hello to a friend with her Pockets-A-Plenty bag! Of course my mother (oh... ya, Kristy is my mom! =]) would harass her for a photo! But we sure are glad she did! Black and White is always an excellent choice, but throw in some martini glasses and we are swooning! Thanks for sharing with us! 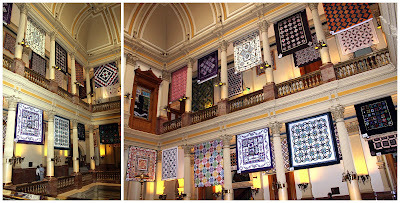 Every other year, the Colorado Quilt Council hosts a quilt show in the Capitol Building in downtown Denver. 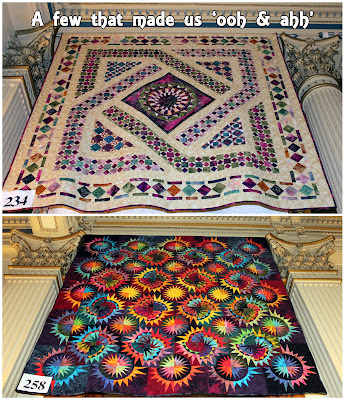 It is a fun show to go see because the quilts mixed the architecture makes for some very interesting and fun combos! Kristy Wolf and I (Shayla) decided to take a mother-daughter field trip for her birthday! 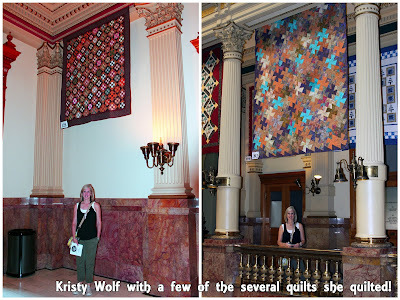 They hang the quilts three stories high! And each story is over 20 feet! So, your neck may be sore the next day from looking up the whole time, but we had a blast anyways! I love the ceiling and all the detailing in the architectural elements! Combine that with quilts and I am in heaven! New personal goal: Have a quilt in the show next year!! Welcome to the New and Improved Whistlepig Crawl Space! We all at least have one room like this in our houses! The place where all things go when there is no more room. This room for WPCreek just happens to be the same room that all the fabric is in! You all saw the pictures of Alayna working on the crawl space/ fabric storage area, so we know it was not a simple task! But she did it! And it is PERFECT! We can walk down there and put our hands on anything we need, when we need it! 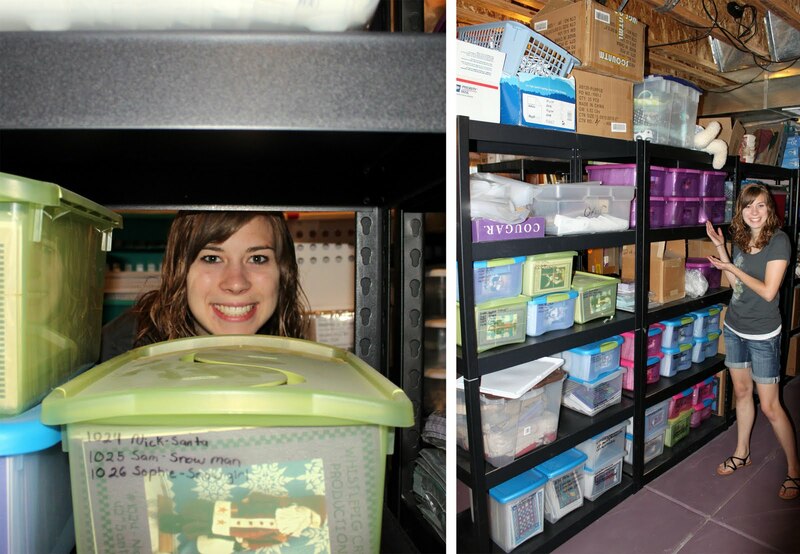 Here are some photos of Alayna touring us through the newly organized areas! Welcome to the bin room! We still sell everything we have ever designed. This means that we have A LOT of inventory! 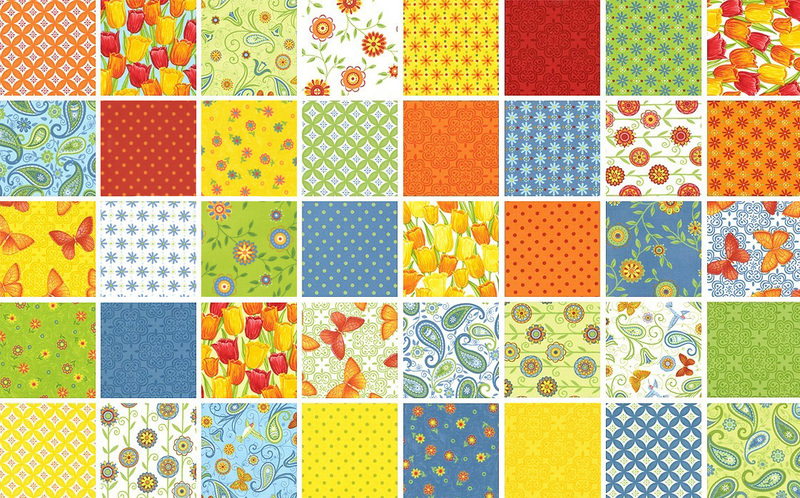 All of those classic Whistlepig patterns are now organized and in easy-access bins! 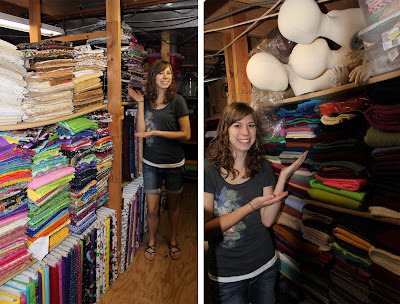 Vanna White, I mean Alayna, is showing us how the cottons are organized here: Novelties, Batiks, Black & Whites, and Lines are all kept together! This makes out lives so much easier! 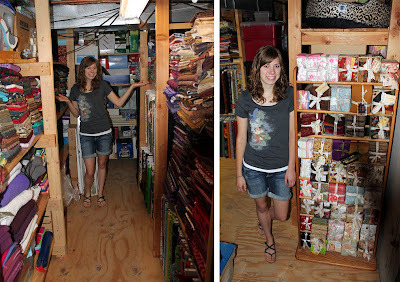 On the right, Alayna is showing off one of many fat-quarter bundle stands that display the fabric so we can see it! 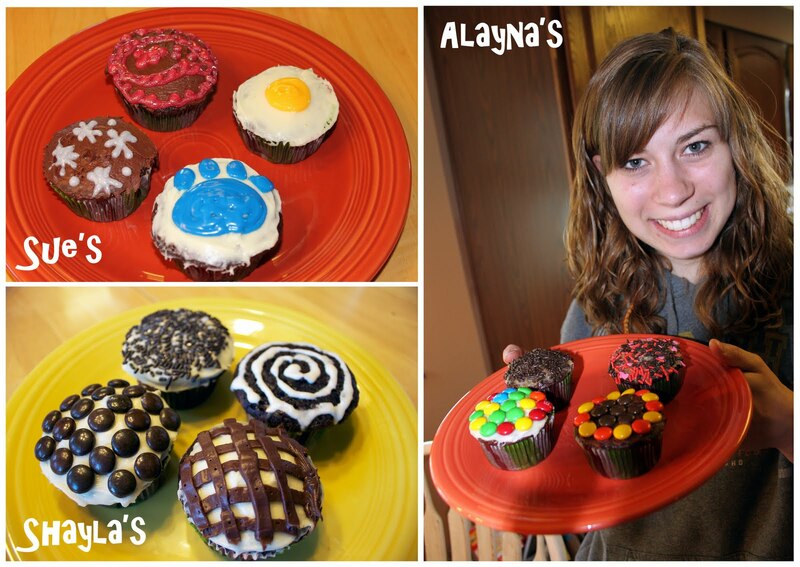 All of Alayna's hardwork paid off! We can walk around and pick fabrics now! Woohoo! Happy Day of Birth to one of our dear friends Kristy Wolf! 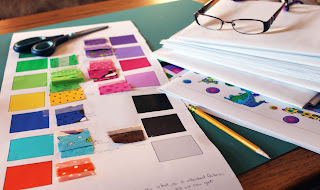 Kristy has been designing patterns for Whistlepig Creek for a few years now. 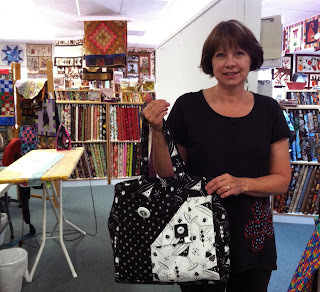 Patterns such as the Sweet Retreat, the Zerba Bag and the Curvy bag are all results of her creative mind! 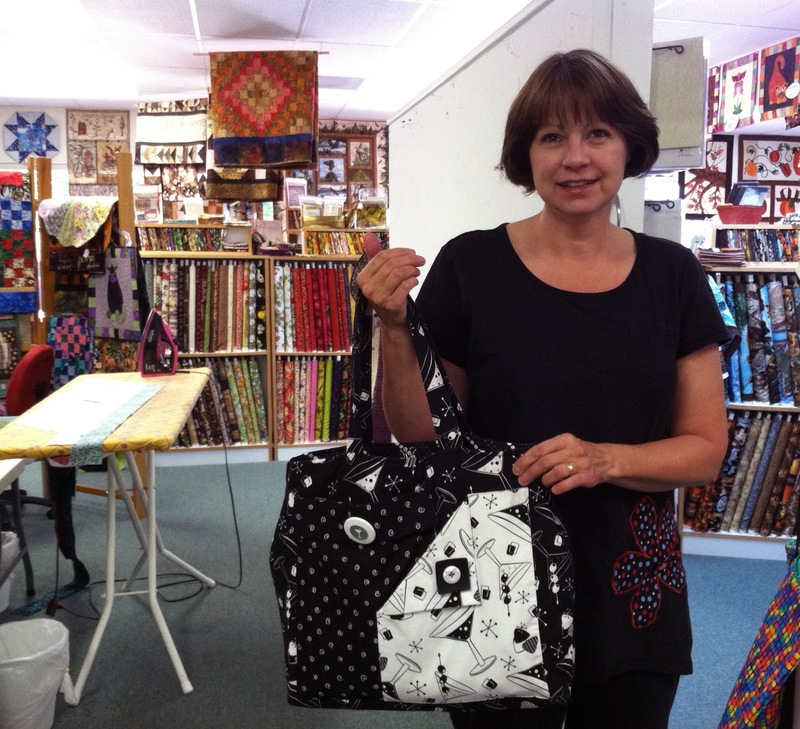 She owns a longarm and has a quilting business out of her home: Wolf Creek Quilting! Happy Birthday Kristy! We hope you have a wonderful birthday and many more amazing and creative years! Cheers! Susan Mulvihill calls herself a fairly new quilter, but you would never guess that by her work! 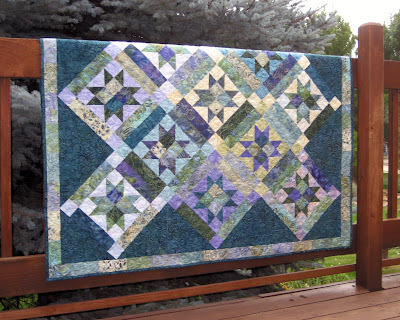 Susan is a member of the Washington State Quilters and a garden columnist for the Sunday issues of the local newspapers of Spokane, Washington. 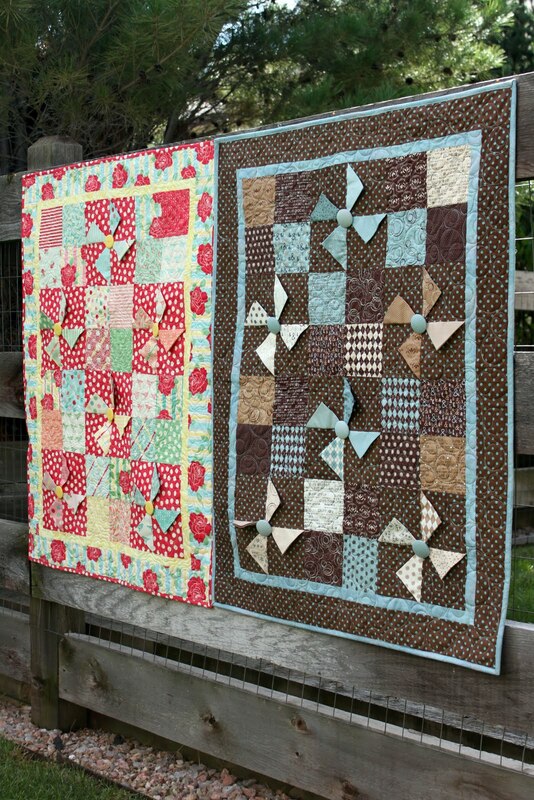 She is a master gardener and I believe it is only a matter of time until she is a master quilter! The bag shown in the photo is the Vive La Tote. 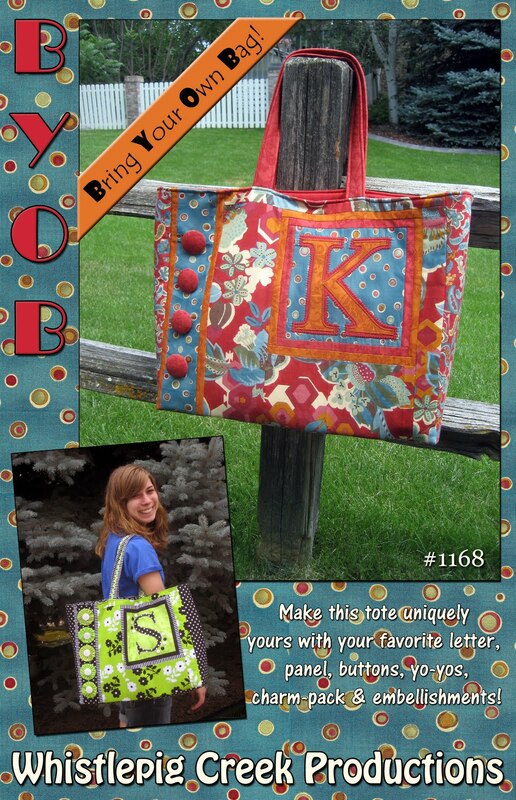 “I really liked the design of this tote and it went together fairly quickly. 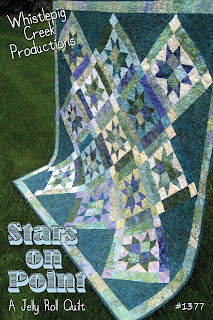 It will be perfect for going to quilting meetings, classes, sewing days with my friends, shop hops and quilt shows. 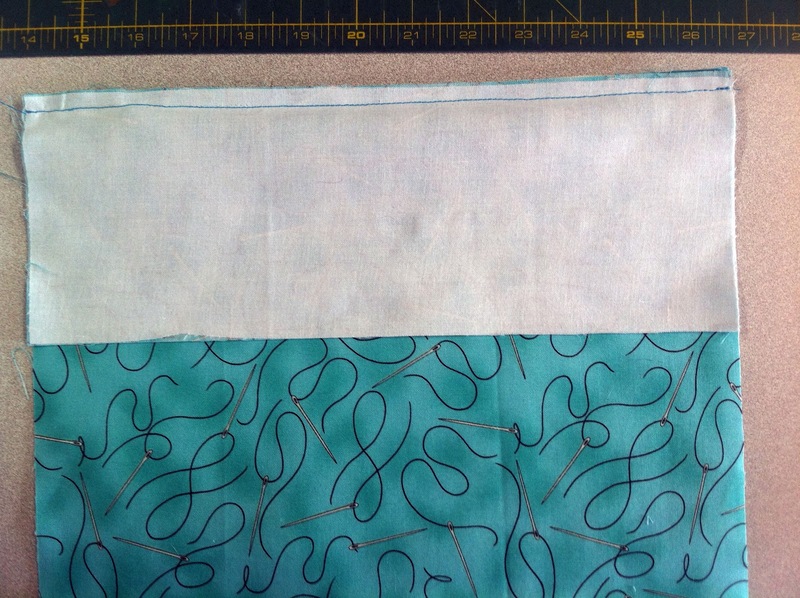 I was attracted to the batik fabrics shown on the pattern photo but decided I wanted to use some richly-colored cottons from my stash. 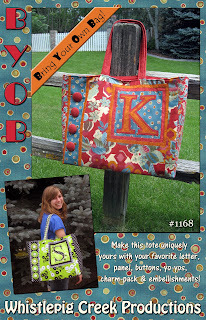 I'm hoping to make some of the small shoulder bags for gifts.” Thank you so much for sharing the tote with us, Susan! It turned out great! We have gotten a few comments and questions about where to find our embroidery characters! We create ours through Lickity Stitch who is on Stitchnet.org. On this website you can find our Dogs, Cats, Dinosaurs, Monsters and many more! Check them out and let us know what you would like to see next! Today at lunch Meghan was telling us about an organization that her family has started donating to. 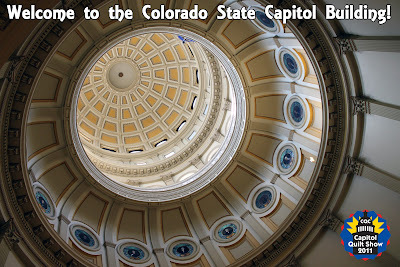 It is called The Redistribution Center Inc. and it is based here in Colorado. The Redistribution Canter gathers and distributed millions of dollars worth of food, clothing, building supplies, toys, furniture, household goods, and other items. These donations serve a wide variety of groups including members of the armed forces and their families, battered women, disadvantaged individuals and families, Native Americans, victims of disasters, terminally ill patients, the aged, homeless and anyone else in genuine need. The Center, which is run entirely by volunteers, picks up donations, warehouses donations until appropriate recipients are identified and distributes the items. They are doing a great service and if you are feeling generous, these guys are a good option! For the first day in what seems like forever, it was nice and cool yesterday morning. There was the perfect overcast for pictures so we pounced on the opportunity! We shot the 'Stars On Point' and had a few giggles while we were at it! This quilt is one of our older ones that we remade in more updated fabrics and revamped the pattern cover. Kristy from Wolf Creek Quilting made and quilted the quilt. 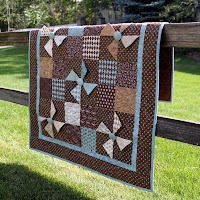 This pattern is perfect for jelly rolls and bali pops or even scraps of strips you have in your stash. We didn't even give him a week before we put him to work! Today he and Alayna are in the office moving and organizing shelves so Sue and I can set up a photography studio! We need a place to shoot when it is cold! Those two (Bugsy & Bernie) are a great match! But we have to keep a close eye on them so they don't get rid of anything we want or need! But they are working hard and we deeply appreciate it! Every once in awhile we come across one of our older patterns that could be renovated and make a splash again! Here are two of our patterns that we just revamped the covers of! Let us know what you think! 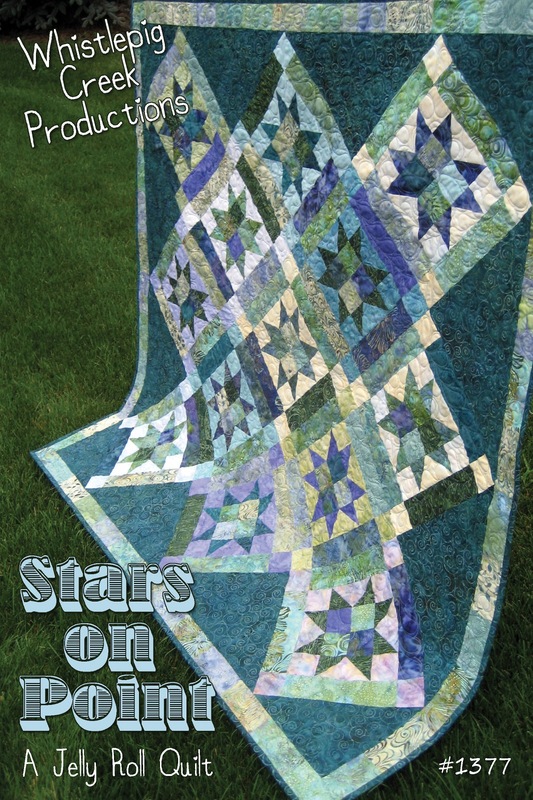 We have the Stars On Point and the BYOB patterns! Both are for sale on the website! Check them out! If you would like to be featured on our blog please send an email to blog@wpcreek.com! 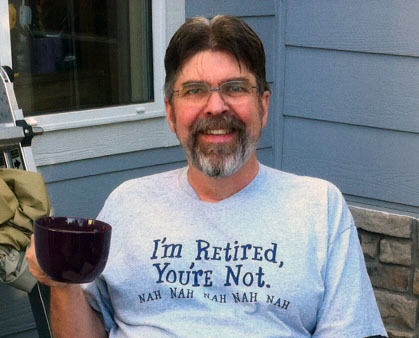 "I'm Retired, You're Not. 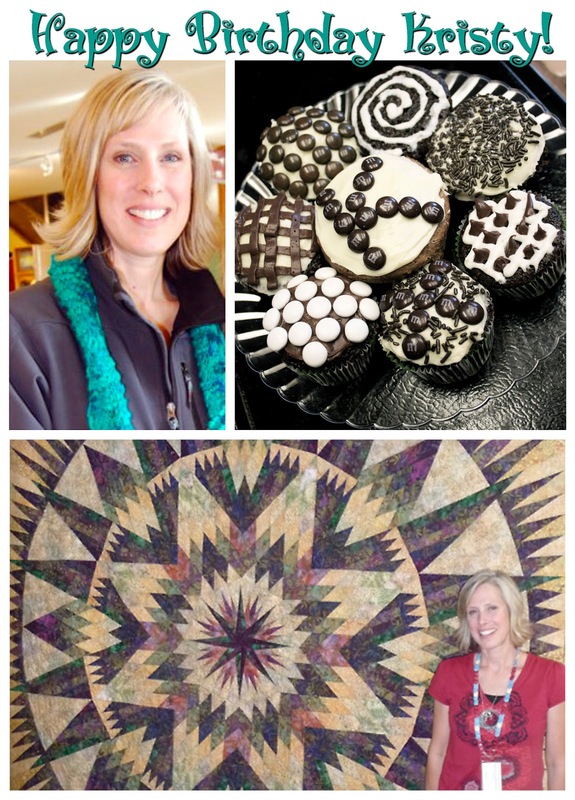 Nah Nah Nah"
The Newest/oldest member of the Whistlepig Creek team is Sue's other half! Bernie just retired from his corporate job and gets a few days of freedom before he starts working for us! We are very excited to have him! The Magazine Mania is still kicking! Here is a Sneak Peek of our project for Fons and Porter's December Issue! 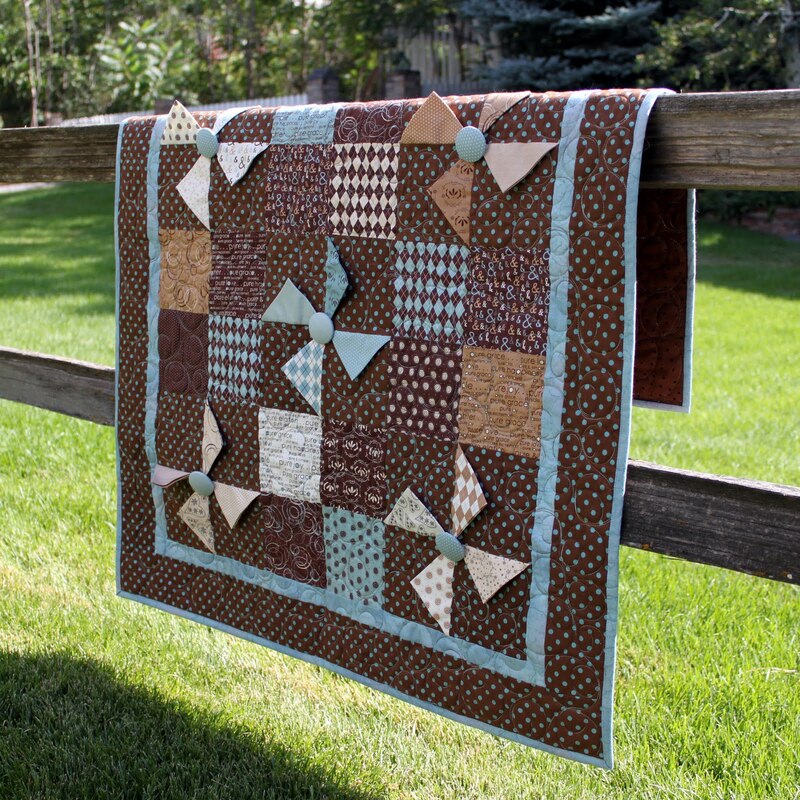 This project is made up of our new line from RJR Fabrics, "Caterwauling Tales." Kits will be available! Without giving too much away: this is a super fun and easy holiday pattern that will brighten a room and bring smiles to faces! Look for it in the December Issue of Fons & Porter! We have been anxiously awaiting the arrival of our new line of fabric: "Caterwauling Tales" from RJR. So, when the box came, we couldn't control our excitement! Now that we have started to use it and a day has gone by, we are loving it! Watch for new projects coming soon. Coming up next: a Sneak Peek of the project for Fons & Porter made up in these fabrics! 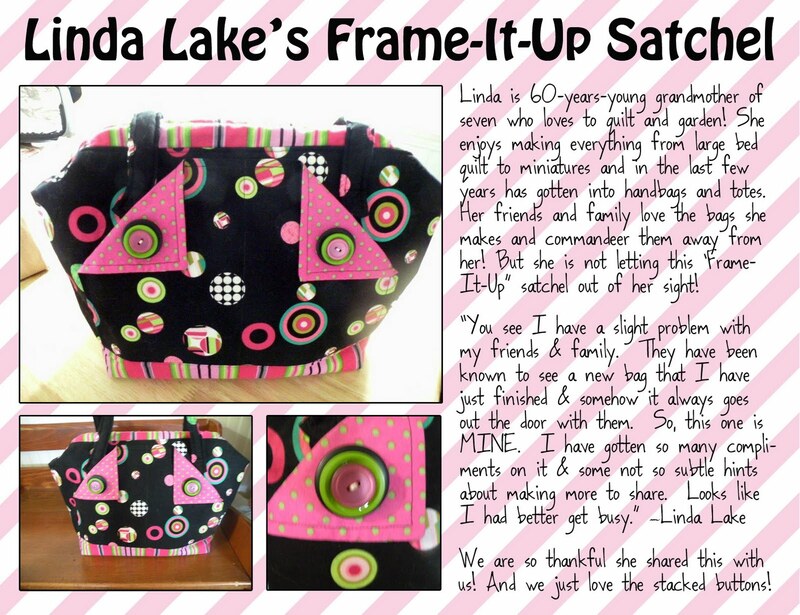 Featured Customer of the Day: Linda Lake! 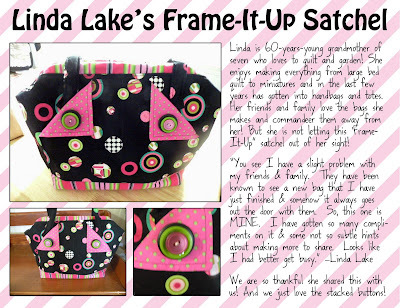 She has made up the Frame-It-Up Satchel in an adorable polka dotted fabric with a fun bright stripe accent! The stacked buttons match the dots on the fabric and give the purse a little flare! Click the photo for a larger view! If you too would like to be featured on our blog, just shoot us an email at blog@wpcreek.com!